The airplex modularity system is a modular radiator series for PC water cooling and represents the competence and know-how of Aqua Computer - manufacturing water cooling systems since 2001. Base component of each radiator is a tube/fin element consisting of 21 copper tubes with aluminum or copper fins and a stainless steel flange. On both ends, terminals made from Delrin are mounted, each equipped with o-ring seals and securely fastened by screws. A recess around each connection thread of the terminal can be used to connect flatly to another radiator using a small adapter - without using bulky tubing. Water flow is predefined by design: Radiators mounted side by side will be connected consecutively, radiators mounted on top of each other will be connected in parallel. The radiator can also be extended in length: Connector modules (sold separately) can be used to connect two tube/fin elements. 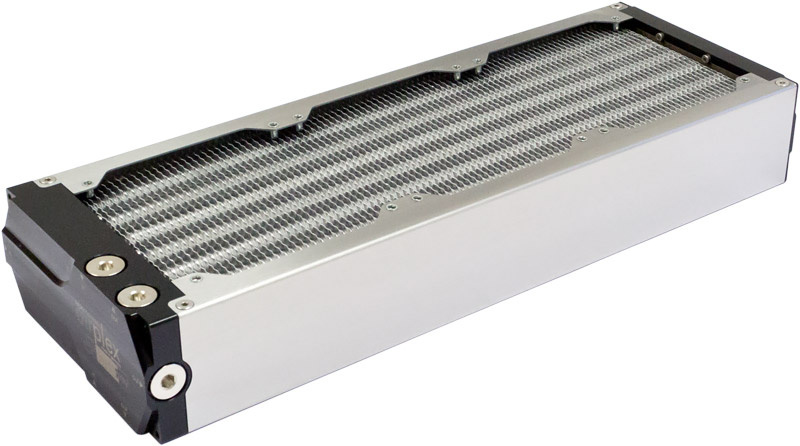 All radiator types have an equal width of 146 mm and fit perfectly into standard 51/4 drive bays. Radiator height (without pump modules) is 63.5 mm, radiator length (without pump modules) can be calculated by adding 44 mm to the specified fan dimensions (for example model 360: 360 mm + 44 mm = 404 mm). All threads are G1/4 and all fittings from the Aqua Computer web shop are compatible. For special configurations, all radiator sizes are available with two separated coolant loops. For these radiators, approximately 70% of the fin surface is used for the primary loop and approximately 30% for secondary loop. Both loops are sealed against each other, there is no transfer of coolant from one loop to the other. Radiator versions with integrated pump module and reservoir reduce space consumption and save time and effort.